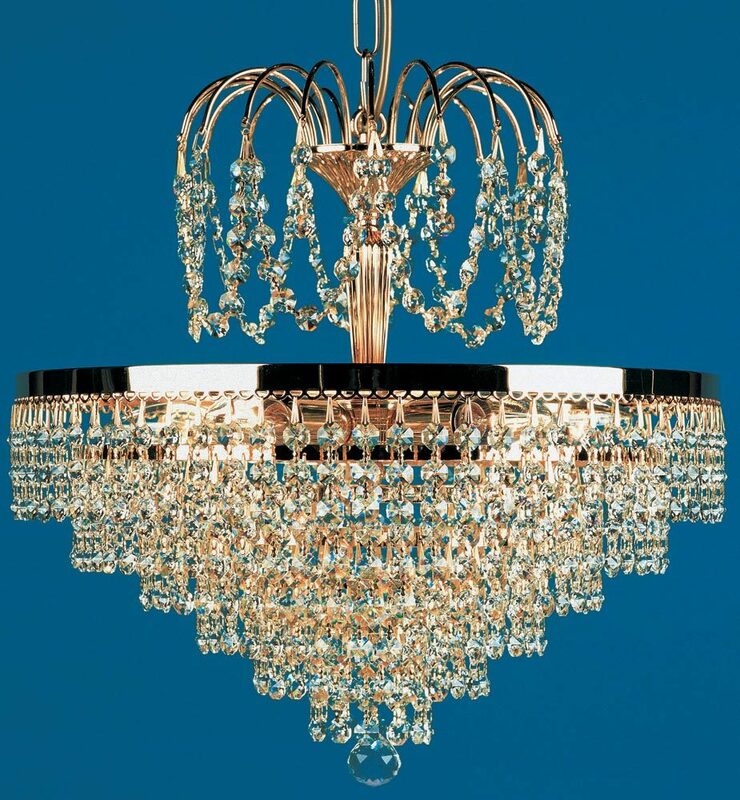 This Impex Bremen Strass crystal 5 Light tier and crown pendant in gold plate is also available in polished nickel and features chain suspension, arched upper frame and tired lower section covered in hanging octagonal Strass crystal buttons. The fluted ribbed central rod supports the top crown, with a colourful array of faceted Strass crystal beads. The circular tiered frame hides the light bulbs, which shine through a curtain of strung faceted crystal beads for a sparkling light. The term ‘Strass’ means ‘perfect surface of glass’ and contains lead quantities of 30% or more. It is considered the highest quality available throughout the world. The polishing creates perfect optic clarity, razor-sharp faceting and unique purity and brilliance. This is a traditional crystal pendant that is suitable for almost any interior style and will add a touch of sparkle to your room. The detailed frame and sparkling Strass crystals look great in any traditional décor and is a great source of illumination for any room, over a dining table, hallway, landing or bedroom. The height given below is for the fitting only, which is supplied with 50cm of chain but can be supplied with any length, please contact us for this option. Also available in polished nickel (ST00005/40/05/N) but there is no image available at this time. If you wish to enquire about this finish please contact us. 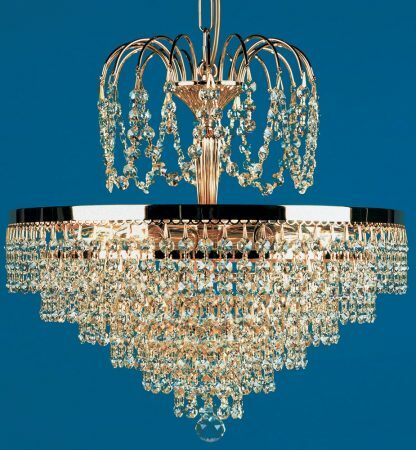 Impex Lighting are one of Europe’s leading manufacturers who supply a comprehensive ranges of fittings in contemporary, traditional and classic styles like the Bremen Strass crystal 5 Light tier and crown pendant in gold plate featured here.